FC Barcelona overturned a first leg 2-1 loss to Levante with a 3-0 victory to reach the Copa del Rey Quarter-Finals. Lionel Messi set up Ousmane Dembélé on the first two goals before scoring one himself to clinch a 4-2 victory on aggregate. 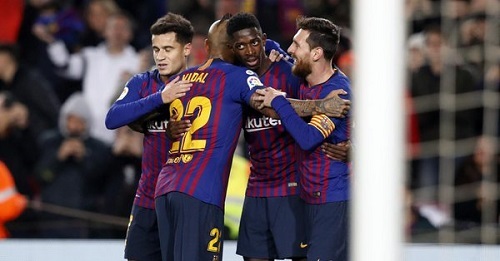 After being rested for the first leg, Messi along with usual starters such as Jordi Alba, Clement Lenglet, Ivan Rakitic and Arthur started the second leg at the Camp Nou. The bench saw the likes of Luis Suarez, Gerard Pique, Sergio Busquets and Marc Andre ter Stegen. It took 30 minutes for Barça to strike first blood in front of the Blaugrana faithful when Dembélé latched onto an excellent Messi’ pass before somehow getting the ball into the net. One minute later, it was 2-0 when Dembélé was set up by Messi again and this time, the young France international managed to get past the goalkeeper Aitor Fernández and got a fortuitous bounce when the ball struck the goalkeeper’s outstretched leg and got in the back of the net. Messi then went from goal provider to goal scorer when he scored in the 53rd minute when he chipped the ball over Fernández and struck the final nail in the coffin in killing off any hopes of a comeback. Barça will now advance to the Quarter-Finals stage with Real Madrid, Sevilla, Real Betis, Valencia, Girona, Getafe and Espanyol. Barça will now shift their attention back to league play when they host Leganés on Sunday. FC Barcelona: Cillessen, Semedo, Murillo, Lenglet, Jordi Alba (Sergi Roberto, 73′), Rakitic, Arthur, Arturo Vidal, Dembélé (Denis Suárez, 76′), Messi & Coutinho (Luis Suárez, 62′). Levante UD: Aitor Fernández, Coke, Cabaco, Postigo (Jason 60′), Rober Pier, Moses, Campaña (Doukoure, 67′), Prcic, Bardhi, Boateng & Borja Mayoral (Dwamena, 60′). Goals: 1-0, Dembélé (30′); 2-0, Dembélé (31′); 3-0, Messi (53′). Cautions: Rakitic (43′), Murillo (44′); Postigo (32′), Cabaco (74′) , Prcic (84′), Rober Pier (91′). Previous PostBarça shutout Eibar 3-0 as Messi nets league goal 400. Next PostBarça battle Leganés to a 3-1 victory.